The lowering of the tax rates benefits everyone. In general, the new tax rates provide two to six percent savings for a married taxpayer and one to three percent savings for a single taxpayer. Therefore, an athlete who is married, earning $100,000, is expected to generate an additional $2,549 in tax savings while those earning $10,000,000 can expect a tax savings of $269,683. In comparison, a single individual earning $100,000 will save $2,612 and those earning $10,000,000 will save $252,260. Although the percentage of savings fluctuates slightly among the different income levels – the graph below indicates the savings between the married and single remain consistent over the different income levels. The loss of being able to deduct state income taxes over $10,000 and the total elimination of deductions for business related expenses for professional athletes is substantial. The question now becomes does the loss of these deductions outweigh the gains received in the lowering of the tax rates? The answer depends largely on the location of the team in which a player plays. Professional athletes play in multiple states and pay both resident and non-resident state tax, often referred to as a ‘jock tax,’ in each state and city in which they play. Even those players who reside or play in states with no state tax are still effected by the limit on their state tax deductions paid for games played on the road. 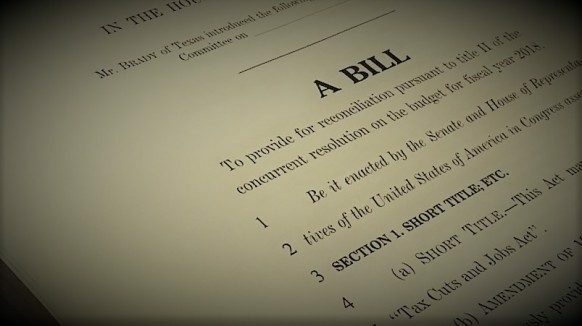 The new tax law lowers the tax rate, however, the loss of deductions, specifically the state tax paid deduction, creates both winners and losers under the new tax law. 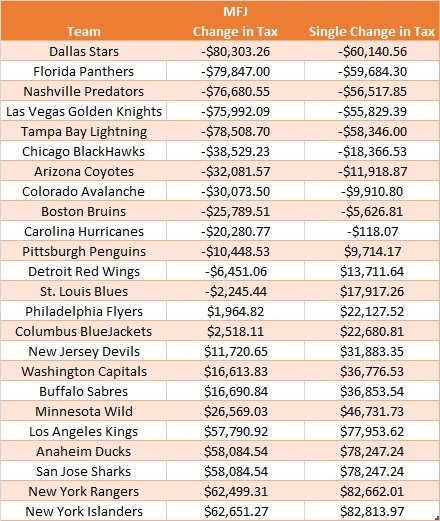 In determining the percentage of tax change, the current and future tax liability of every team was calculated using the NHL’s league average salary of $3,040,692. It was assumed that those on Canadian based teams would file as a Canadian resident, therefore any change in the US tax code would not effect these individuals. As the table above indicates, even after taking into consideration the loss of deductions, there are those who still benefit from the new tax law. However the location of the team dictates the tax liability. 54% of the players (13 out of 24 US based teams) who are married, will benefit from the new tax law while only 37.5% of single players will see the same positive result. Married players on the Stars, Panthers, Predators, Golden Knights and Lightning represent the maximum savings of seven percent discount in tax – single players on the same team will receive five percent. Teams based in California and in New York City represent the biggest losers as players on these teams can expect to pay between six and eight percent more in tax this season. In addition, single players playing in Pennsylvania, Ohio, New Jersey, Western New York and Minnesota will pay between one and five percent more in tax. The fact that there are winners and losers now increase the effect of the ‘jock tax’ and the disparity between teams. Players who play in Florida, Nevada, Tennessee, Texas are subject to the lowest potential jock tax and receive the greatest benefit from the new tax law. In comparison, players on teams based in California, New York and Minnesota are subjected to the highest jock tax and therefore end up paying more in tax under the new tax law. The combination between these two factors causes the net value between teams based in these states to become even greater. With 20 of the 24 states in which professional athletes play implementing their own version of the ‘jock tax’, it is now even more important than ever to have professional guidance from an individual who specializes in understanding all the unique issues that face professional athletes. Overall, everyone is going to be affected differently as every individual’s situation is unique, but everyone should be aware of the effects of the new tax law for effective future tax planning.